9 rounds in 5 days? I can't imagine that. DW and I played 4 rounds in 4 days and that was enough for us. Our caddy told me that most who play two rounds per day barely finishes the 2nd round. I actually felt pretty good physically at the end of the week. It helped that I was able to play round 1 and round 9 by myself and the courses were pretty empty so it only took about 3 hours for those two rounds. I was mentally shot, however, just no concentration left, at all. I can believe that most people are dragging, my buddy's cousin who joined us this year was one of those. There are a LOT of people walking very slowly around BD. I'm just getting back into golf since retiring last year. Last I played was in a casual league through work back in the 90's. I was never very good. I played in a women's league this spring/summer and had fun. I realize I need to invest in lessons and get a driver. I'd like to get better. DH likes to golf and takes 2 golf vacations ( desert areas) in the Spring and Fall with the guys. I hope he will join a league when he retires next May. I look forward to some golf vacations in the future. As I said in an earlier post, I'm a fan of lessons, and the current series I'm now taking was a gift from DW. I hope you do get to a point where you and DH can take golf trips together; sounds like a great time. I don't know much about the courses in your area, especially on Whidbey Island itself. The only course I've played in the region is the one at Port Ludlow. DW and I took a vacation to Seattle/Olympic Penninsula/Victoria/Whidbey Island ~15 yrs ago, and I played then; she rode in the golf cart and read a book, occassionally helping me look for a lost ball. You may be whatever you resolve to be. So, as I noted in the OP, I'm taking lessons and they are helping me improve my game; so far, by lowering my Handicap index by ~2 strokes. Since I've been taking these lessons for only 2 mos, I'm pretty pleased with that. The first 6 weeks of lessons were all on the full swing. The past two weeks have been on the short game. This week's lesson (taken yesterday, Monday) was a putting lesson. It's probably the most important part of the game so, it's an important area to be proficient in. But, based on the stats from "Swing-by-Swing", putting is not a weakness in my game. I average 1.7 strokes/hole & 1.9 strokes/GIR; both figures are pretty respectable. Frankly, I'm surprised they're that good. But, I typically play on courses with moderate difficulty (not super-undulating) and moderate speeds (9-10 stimp). Anyway, the way my lessons always progress are, me swinging (putting in this case) the way I normally do, observed by my instructor and recorded on video (as the "before" swing). My instructor then gives me feedback on what's good and what to change. I then practice this several times, going through several iterations with continuing instructor feedback, all on video. Then, when I produce what he's looking for, he asks me how that feels to me; we record that plus any other key points from him in the notes for the session, along with video of the properly produced swing (putt). Those notes and video go into my online file, along with some standard GolfTec "drills" for whatever it is one is trying to do. All of this is then immediately accessible by me from any device on which I've downloaded the GolfTec App; I chose my phone. I thought the golfers on this thread might be interested in the structure of the lessons, which I find very 'data based' and effective. And, the immediate accessibility anywhere is great! 1. Locate the ball 'one ball' forward of the middle of my stance. 2. Make my putter shaft a bit more vertical, aligning with my forward arm. 3. Use a bit more forward press than I'd been using. Everything else: position, stance, routine was good. All of the recommended changes are to get the ball rolling forward as quickly as possible. The video (a worm-cam) showed that my putts actually skidded forward almost a foot before rolling, which is not good. After making the recommended adjustments, the putts were rolling after 2-4 inches, which was clearly visible on the video. After that, we went to the practice putting green to test how well I'd taken the lesson on board. My instructor also recommended the "Ladder Drill", where you line up putts that are progressively one foot longer each time (typically from 3-8 ft). OK, there you have it---this week's lesson. I use putting drills from Pelz. 20 footers, different angles. Get 10 (in a row) to the hole and no more than a putter length beyond. Make 10 putter length putts (with your eyes closed). Takes 10-15 minutes on a good day. Really teaches distance control in line with his " optimum speed of 18" beyond hole" theory. Great drills! Especially for speed control & lag putting. I'm going to have to try the 3-footers with my eyes closed. Seems it would give one confidence on short putts. I played Rancho Solano in Fairfield, CA for the first time yesterday. What an awesome course! It's as good as described in the great Golf Advisor reviews it's received. It is also a great deal @ $32 to walk 18. The course is very well watered & lush considering the drought. And, the greens are as large, undulating & difficult as described in reviews. I highly recommend this course if you live nearby or are in the area. Here it is. It includes 5 courses and 3 practice ranges in my area. I already play regularly at two of these courses. I plan to buy the $800 card, which will give me a 33% discount on golf. I can use it to play in the Ladies' Leagues at these courses too. Play Golf Kelowna : It's okay to play around. I don't know why more courses in join force to offer cards like this. That'd be much preferable than playing the same course over and over (the situation I am in). I know what you mean. If I'm not very thoughtful while practicing or playing, my bad habits also return. Although my lessons have helped tremendously, it is still not yet second nature for me; I have to think about the lessons & concentrate. Golf and tourism are big in my area. The course at which I have a membership is on Aboriginal land, has a delightful junior golf academy, and hosted the provincial bantam championships this summer. Collaboration is to everyone's advantage in making this a family friendly golf destination. This morning I played a foursome in bright sunshine. One player was an 80 year old lady whose drives were further than anyone else's and consistently down the fairway. She was amazing. Over the summer I have golfed two different times with women who had beautiful smooth swings, no huge swing speed, but who consistently made solid contact and the ball just jumped off their club. Fun to watch. One was in her mid sixties and the other was in her 70s. I have a speed stick so I can measure my buddies' swing speeds. Mine is around 100. I usually tag it 230-250 off the tee, sometimes more. I have one buddy that hits 130 mph on it and can blast it over 300, but not consistently. I have another buddy who hits 100 mph, but can hit it 330. He has outstanding tempo and impact. I guess that's what happens when you've been playing golf since you were 4. Sounds like you can tag more than 230-250 with your swing speed of 100. Swing speed of 90 should be good enough to hit the ball about 230-250 (including roll) if you launch at right angle, etc.. My 2 cents. I'm usually 220-230 yds off the tee but, hit a lot of fairways. I'd love to consistently have another 20-30 yds so I'm hitting shorter irons onto long Par-4 greens. I'd rather be 260 off the tee & hit 70% fairways than 300 & hit 40% fairways. Gotta keep working on that part of the game. I see so many of my fellow golfers going out and putting down $350 or more every year on the latest driver to try and gain extra distance, and it never works. Better technique, increase strength and flexibility may help but it all comes down to swing speed, some people just have the natural ability to swing fast, some don't. Many of those old guys who have lost distance because of age can still shoot good scores. They just know how to get the ball in the hole with very good short games. I know from experience, they have lighten the load on my wallet many times. What tees are you playing? The group I play with (mostly mid handicappers in our 60s and 70s) shifted to the forward/senior tees this summer and are enjoying the game much more, particularly on our home course. On many holes the difference is slight (perhaps 10 yards) but on the long holes the difference is more substantial and it makes our home course much more friendly. Interestingly the rating and slope are not very different (68.9/130 vs 66.4/124). 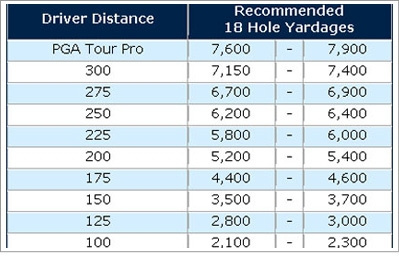 According to the PGA Tee-It-forward chart, if you hit drives 220-230 yards off the tee you should be playing the tees that equate to 5,800 to 6,000 yards. I won my flight in the sr club championship last month and we played the forward (white) tees, two rounds medal play. A lot easier than the blue tees. I don't like to play the black tees at my club as there are a few holes that are just unfair from back there. My regular group always plays the blue tees. I started playing golf right before I turned 50. I married my wife a couple of years later in 2012. We both still w*rk. Sorry for the foul language. Golf has been a great past time that we both enjoy together and typically play one nine hole during the week and twice on the weekends. We found that we were basically paying more each month then the monthly fees at a very nice country club and decided to join. I typically play our forward/white tees. I took off Friday to play with a friend at a different club and joined him on the blue tees. I added about seven strokes due to the distance and unfamiliarity with the course. I did the same thing on Sunday, another course, blue tees, seven additional strokes. I know where I belong! I am working with the club pro on increasing my swing speed. My irons are definitely improving. I believe that my driver does not have enough loft so will be working with that too. All that being said golf has been a blast and I see my wife and I playing together for many years to come. One question to all would be recommendations for a mat and net in the garage to hit through the winter?